"The Whisper Out of Time" is sanctioned for use in Pathfinder Society Organized Play. The rules for running this Adventure Path and Chronicle sheet are available as a free download (723 kb zip/PDF). 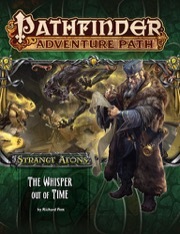 - The formula of Pathfinder Adventure Paths gets in the way of mood, story, plot. - No fleshing out of travels to Cassomir, Okeno, or the Parchlands. Even simple tables of possible encounters would have been appreciated. Instead, it lazily references other works. - Even parts that show promise, such as A Symphony of Madness, end with a whimper. - Some artwork is unfortunate (Mun looks like he's from early 1900's New York, and Twain looks nothing like a derro). - Speaking of derro, the whole derro involvement feels stolen/borrowed nearly piecemeal from No Response from Deepmar. - Creatures encountered can be anachronistic (witness the clockwork vivisectionist) and diminish the feel of the module. - Maps are small and poorly detailed. - Poor editing; there are a number of typos littering the pages, reinforcing the feel of this being a rushed, shoddy module. - Weird that a haunt of words and ideas lifting from pages and attacking players would do 10d6 physical damage, as much as falling 80 feet. Lazy design. - Political correctness (gender activism) runs rampant in the back half of the module, detracting from the story. The use of "they" to refer to a creature is distracting and confusing. - The process listed for creating a Hollow One makes it exceedingly unlikely that Mun would have created multiple hollow ones of himself, further straining credulity. Most concernedly, this module doesn't "feel" like an Elder Mythos adventure. I expect better from Paizo. Part 1 (Cassomir) has a good mix between Cthulhu Mythos and Pathfinder atmosphere. Part 2 (Katheer) is the part where the Mythos atmosphere is strongest. The "Ecology of the Yithian" article is excellent! The Bestiary section is good. The battle-maps are disappointing, they are very plain and unevokative and the last one is too big to fit even on a "Bigger Flip-Mat". The Okeno gazetteer doesn´t offer enough information. There is no clue where to place the "Old Infirmary" anywhere in Cassomir and the location of the "Blossoming Thorn" in Okeno is not given either. You ABSOLUTELY need Pathfinder Chronicles: Cities of Golarion and Pathfinder Campaign Setting: Qadira, Jewel of the East, both excellent books, if your players decide to visit some other locations in Cassomir and Katheer and if you don´t want to pretend the encounter locations exist in thin air. The CR of the opponents in part 3 are way below the group, there is not a single enemy that won´t be taken down in 1 round. A level 12 party can take on the whole fortress at once and lose not a single PC. The GM has to invest lots of extra time into this part to flesh out the three cities and to replace EVERY opponent in part 3 (lots of low CR creatures DON´T add up to a high CR challenge). This adventure would have been better if it took place in only 2 cities. I wonder wich great old one this volume will have. -Tsathoggua, Father of Night by Clark Ashton Smith in book 3.
as most "urgent" adaptations from the article in AP# 109. Book 5 will most likely contain Xhamen-Dor, the Inmost Blot. I'm a little sad we don't get Mhar but Xhamen-Dor is acceptable. Chaugnar Faugn vs. the Oliphaunt of Jandeley! Fight! Me personally I am hoping that it is Atlach-Nacha. Book 5, I am betting on Xhamen-Dor as well. "Encounter the mysterious and alien entity that has been haunting their dreams." Endangered species and all, you know. But their tentacles are so exotic and they make terrific Flumphy Pillows. Shipping will begin on november 30th. That means the description will probably be updated on friday 25th of november. Thursday the 24th of November may interfere. Updates are mostly done on wednesdays or fridays, sometimes on mondays. Thursday the 24th of November is Thanksgiving in the States. As it is close to the weekend, it is possible that the Friday may be included as part of a long weekend, which is what I think Plausible Pseudonym was getting at. I'm sure we'll know for sure next week. Sara Marie said that Paizo will be closed on Friday the 25th of November. I'm sure there won't be an update on Friday because of Thanksgiving. There probably WILL be an update on December 3rd though. my understanding is that American thanksgiving is in fact a 4-day holiday. AP #111 got updated 1 workday before shipping started to subscibers. As shipping to subscribers starts on wednesday 30th of november, i guess this will be updated very shortly before (monday 28th maybe). Correct. This is the updated and accurate text and image. I could swear that the description hadn't been updated when i wrote this. The article about Yithians will be interesting. After Shattered Star, I'm hoping it will offer more insight than if I had just read The Shadow Out Of Time instead. Just noticed that flumph is exactly the sound you hear when you plunge into it, head first. Holy crap, FLUMPH ARE POKÉMON. Already billed for this, but the .pdf hasn't appeared yet. How long does that usually take? Yeah, the second module left me a bit flat, but the third one really made me sit up and take notice. Fingers crossed. I'm still disappointed they didn't go with my submission The Whisper Out Of Tyme, a Victorian era cookbook. So anyone got a copy of this yet and wanna spill some beans? -Chaugnar Faugn, the Horror from the Hills by Frank Belknap Long? So what are the monsters(name, CR, type, etc.)? First-time poster here to join the fun! -Clockwork Vivisectionist (Construct, CR 10), a wind-up construct that walks around in search of living creatures to cut up after a dose of anesthesia. -Hollow One (Construct, CR 10), an intelligent, lifelike construct made in the likeness of a specific person. -Hooded Harbinger (Abberation, CR 12), a messenger sent directly from the big Yellow H himself. Nasty piece of work. -Proto-Shoggoth (Ooze, CR 11): What you'd expect. There's also a bigger, CR 14 version that is created when two Proto-Shoggoths fuse. "You see, son, when two proto-shoggoths loves each other very much and want to always be together..."
The most awkward Dungeoneering recall ever. So uh...did anyone else's volume show up in their downloads under "Taldor, inc", and not in the Strange Aeons AP section of their downloads?